Attenuation correction is an essential requirement of positron emission tomography (PET) image reconstruction to allow for accurate quantification. However, attenuation correction is particularly challenging for PET-MRI as neither PET nor magnetic resonance imaging (MRI) can directly image tissue attenuation properties. 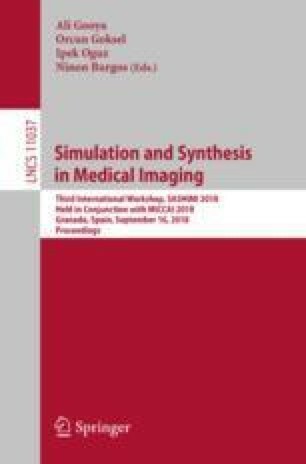 MRI-based computed tomography (CT) synthesis has been proposed as an alternative to physics based and segmentation-based approaches that assign a population-based tissue density value in order to generate an attenuation map. We propose a novel deep fully convolutional neural network that generates synthetic CTs in a recursive manner by gradually reducing the residuals of the previous network, increasing the overall accuracy and generalisability, while keeping the number of trainable parameters within reasonable limits. The model is trained on a database of 20 pre-acquired MRI/CT pairs and a four-fold random bootstrapped validation with a 80:20 split is performed. Quantitative results show that the proposed framework outperforms a state-of-the-art atlas-based approach decreasing the Mean Absolute Error (MAE) from 131HU to 68HU for the synthetic CTs and reducing the PET reconstruction error from 14.3% to 7.2%. This work was supported by an IMPACT studentship funded jointly by Siemens and the EPSRC UCL Centre for Doctoral Training in Medical Imaging (EP/L016478/1). The research was also supported through the UK NIHR UCLH Biomedical Research Centre.